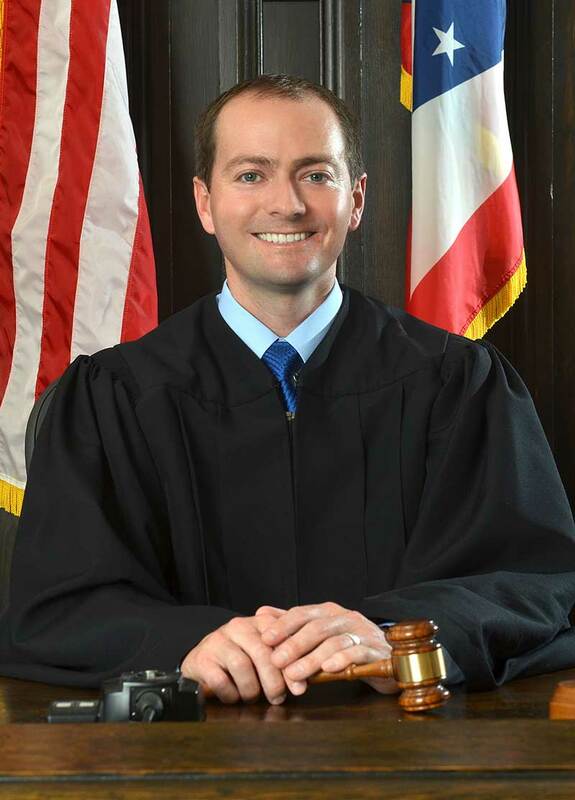 JUDGE JON OLDHAM is a lifelong Summit County resident. He graduated from Walsh Jesuit High School, Ohio University, and The University of Akron School of Law. Judge Oldham began his legal career as a law clerk working for the Summit County Prosecutor’s Office and two local law firms while he was in law school. Through his work as an attorney, he represented clients in various administrative agencies and courts throughout Ohio including municipal courts, county courts, appellate courts, federal courts, and The Supreme Court of Ohio. During this time, he also served as a visiting magistrate in the Akron Municipal Court. As an attorney, Judge Oldham was selected as a Super Lawyers - Rising Star in 2009, 2010, 2011, 2012, and 2013. Rising Stars are selected through a peer and achievement based review by Law and Politics Magazine. Rising Stars are Ohio’s best attorneys who are 40 or under, or who have been practicing for ten years or less, representing the top 2.5% of Ohio lawyers. Before taking office as Akron Municipal Court Judge, he served as a magistrate to Judge Elinore Marsh Stormer in the Summit County Probate Court from 2013 to 2015. Judge Oldham was elected to the Akron Municipal Court in 2015, and was selected to serve as the Administrative/Presiding Judge of the Court in 2019. Since 2016, Judge Oldham has presided over Recovery Court, which is a specialized docket intended for drug abuse offenders to provide them with the opportunity to overcome the disease of addiction and achieve long term recovery. Recovery Court is an intensive program and requires participants to successfully meet all of the demands of the program, including treatment, aftercare, sobriety, case management, and drug free status for 12 consecutive months. The Akron Recovery Court was recertified by the Supreme Court of Ohio in 2017. Judge Oldham’s hard work and commitment to our community began at an early age. While in high school, he earned the Eagle Scout rank, the highest advancement rank in Scouting, from The Boy Scouts of America. Judge Oldham’s Scouting experience provided him with a solid foundation for being a successful leader. In 2012, the Greater Akron Chamber of Commerce recognized Judge Oldham’s commitment to our community and his success in the legal profession by selecting him as a ‘30 For the Future’ Award Recipient. In 2014, he received the Past Unforgotten – Outstanding Community Service Award from Greater Bethel Baptist Church. In 2019, he received the Harold K. Stubbs Humanitarian Award and the National Eagle Scout Association (NESA) Outstanding Eagle Scout Award. Judge Oldham is actively involved in many community organizations, including serving as a trustee of the Great Trail Council of the Boy Scouts of America and CHC Addiction Services Foundation, and as a member of the Oriana House Advisory Committee. Judge Oldham’s past service in our community includes serving as a trustee of the Akron Bar Association and The Victim Assistance Program, as a committee member of the Conservancy for the Cuyahoga Valley National Park and the Jewish Community Board of Akron, and as a Volunteer Attorney for the Community Legal Aid, Open M Clinic. Judge Oldham is a member of many organizations including the Akron Bar Association, the Ohio State Bar Association, the Akron Bar Foundation, the Fairlawn Area Chamber of Commerce, the Cuyahoga Valley National Park, and is a life member of the NAACP. Judge Oldham served as a mentor attorney for the Law and Leadership Institute in 2010, 2011, and 2018, which allowed him to work closely with students in our community considering a legal career. Judge Oldham resides in Akron with his wife and their three children.